I’m on day #8 of the flu. The nice thing about day #8 is that my head is finally clear enough to read, so I spent last night pouring over magazines and books. Just before bedtime, I read The Secret of the 5 Powers, a comic book featuring Thich Nhat Hanh. The comic touches on the actions of two monks, Thich Quang Duc and Nhat Chi Mai, who practiced self immolation (burning oneself to death), during the Vietnam War. Don’t ask me why I’m reading this stuff after coughing my lungs up for a week, but I learned something totally fascinating and couldn’t wait to share on BUBs this morning. You may or may not know this already, but for whatever reason, I’d never learned what happened in the aftermath of the burning expressions in 1963. This is not folklore. This is true. 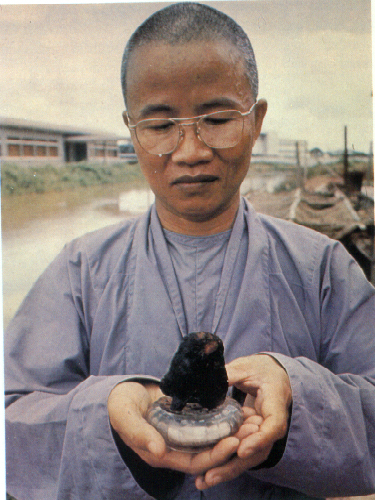 On June 20, after six hours of cremation, all of Thay Quang Duc’s body had become ash, except his heart, which was still dark reddish-brown and intact. After a second cremation, at 40,000 degrees Celsius, his heart remained exactly the same shape, although an even darker color. Please feel free to share reactions in the comments below or link your own blog post to this page.